COLUMBUS, Ohio (Mar. 18, 2015) – The 4R Nutrient Stewardship Certification Program has announced Tyler Grain & Fertilizer Co. in Smithville, Ohio has been added to its growing list of nutrient service providers to achieve certified status. Tyler Grain & Fertilizer Co. has been in operation since 1860 and is under its fifth generation of family ownership. The company currently has 16 employees that work to promote the 4R’s under the leadership of President and Owner Ty Tyler, Vice President Bill Tyler, Certified Crop Adviser Agronomist Dustin Ramsier, and General Manager Nick Franks. The 4R Nutrient Stewardship Certification Program certifies that individuals and entities in the tri-state area that sell, apply or make recommendations on how fertilizers should be applied to crops are doing so in accordance with 4R Nutrient Stewardship principles – which refers to using the Right Source of Nutrients at the Right Rate and Right Time in the Right Place. Applicants must go through an audit and demonstrate they not only understand 4R principles, but also follow them. Tyler Grain & Fertilizer Co. marks the fifth nutrient service provider to earn the 4R Certified status. Over 300,000 acres and 500 farmers are serviced by those who have received 4R Nutrient Stewardship Certification. 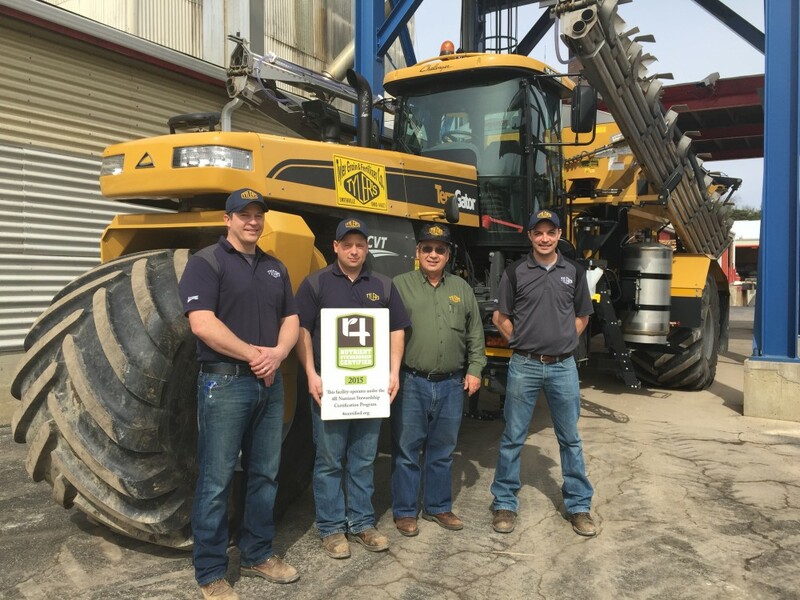 “Tyler Grain & Fertilizer Co.’s employees worked very hard to ensure that its operations were following the 4R’s, and we congratulate them for their stewardship practices and success,” said Andrew Allman, executive director of the Nutrient Stewardship Council. “By becoming 4R Certified, Tyler Grain & Fertilizer Co. has proven its dedication to the long-term improvement of Lake Erie’s water quality,” said Carrie-Vollmer Sanders, Nutrient Stewardship Council chairwoman. “We are proud of all nutrient service providers that have begun the process of becoming 4R Nutrient Stewardship Certified. MEDIA: Download a high-resolution photo of the facility receiving its 4R certification sign. PHOTO CUTLINE: Employees at Tyler Grain & Fertilizer Co. hold a sign commemorating the facility achieving 4R Nutrient Stewardship Certified status. From left to right: Nick Franks, general manager; William (Bill) Tyler, vice president; Walter (Ty) Tyler, president; and Dustin Ramsier, CCA agronomist.